After the well publicised Dropbox security failings, I started searching for a solution which would allow me to encrypt private data held in my Dropbox while still having easy access to it from my personal Mac. I could create a Mac encrypted disk image but this would be unwieldy to manage and probably result in large file updates whenever any of the contents were changed. A more elegant technical solution is to create an encrypted user-space filesystem. It’s a bit more work to setup and you will need a combination of tools, but it does allow for a much more flexible and manageable configuration. 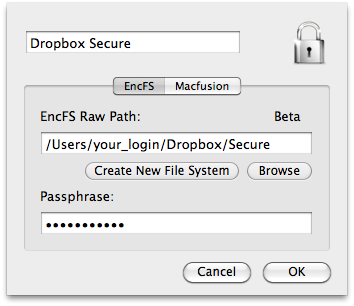 I want to make this installation as secure as possible so I’m not going to store the EncFS key file on Dropbox. To accomplish this I use a neat trick. Answer ‘yes’ when prompted to create the new folders and choose ‘p’ for pre-configured paranoia mode (256-bit AES encryption). Enter a secure password when prompted and you’re done. Now the filesystem has been created we can deal with the key. … and replace with a simple wrapper script. Use the Macfusion GUI to mount and unmount the volume when you need it. You should now have an encrypted volume in your Dropbox which you access via your local ~/Documents/DropSec mount. The security of the ~/.encfskeys/dropsec.xml key file is of paramount importance. This is the EncFS decryption key which must stay in that folder. If you delete this file then all your encrypted data is gone forever, so keep a secure backup somewhere else just in case. 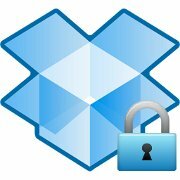 UPDATE: Read this post for a new method of creating a secure Dropbox folder. This entry was posted in Apple, General, Security, Techie and tagged .encfs6.xml, dropbox, EncFS, ENCFS6_CONFIG, MacFUSE, Macfusion by djh. Bookmark the permalink.